The M18 FUEL Hedge Trimmer has the power to cut 3/4 in. 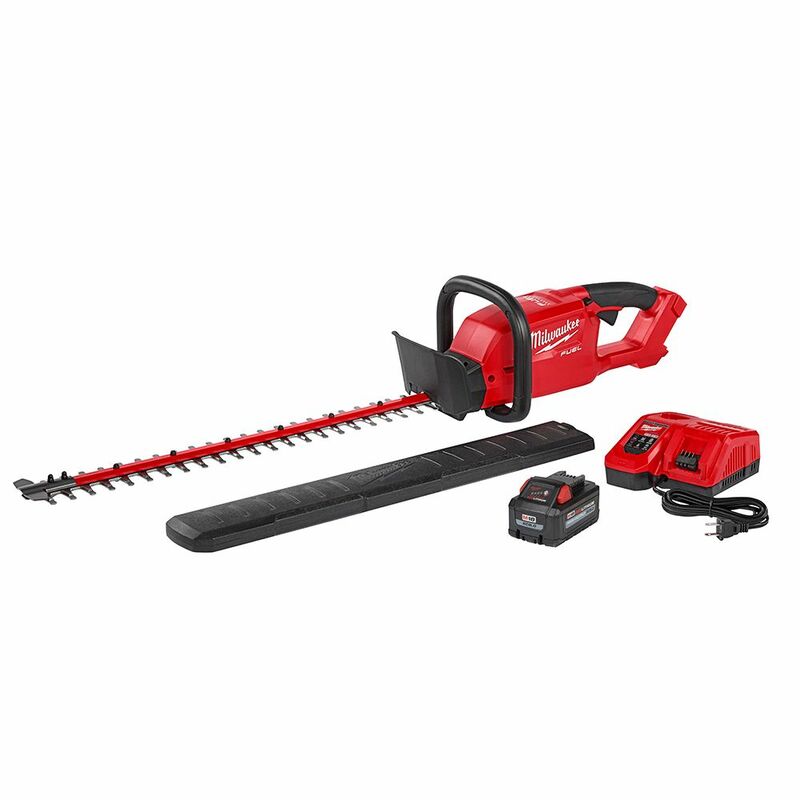 branches, cuts up to 30% faster and provides up to 2 hours of run time per charge. Designed to meet landscape maintenance professional needs, the handle placement and weight distribution provide the best combination of balance and control. The trimmer features a slider-crank mechanism and all-metal gear case providing unmatched durability and longer life. The 24 in. blade trims more material in a single pass, increasing reach and productivity. The blade tip guard prevents damage to the property and the blades. The M18 FUEL Hedge Trimmer is fully compatible with 125 plus solutions on the M18 system. The BLACK+DECKER LST522 20V Max Li-Ion 2-Speed String Trimmer is ideal for trimming areas of overgrowth after mowing and edging along borders, sidewalks and flower beds. This trimmer features run time extension technology with a super-efficient dual-mode accelerator switch for high performance and longer run time. The adjustable height and pivoting handle positions provide maximum comfort and control. Cut, shape or trim shrubs with this Black & Decker Electric Hedge Trimmer. A cordless tool, this trimmer features a rear rotating handle offering a more comfortable hand position when making vertical cuts or sculpting as well as an innovative inline motor design that delivers improved balance, control and precise trimming. The DEWALT DCHT820B 20V MAX Hedge Trimmer (Bare Tool) has a high output motor and laser cut, hardened steel blades engineered for clean, fast cuts on branches up to 3/4 of an inch thick with 22 inch. of blade length. The compact and lightweight 7.5 lb. design maximizes manoeuvrability and minimizes stress on your arms. Bare Tool: the tool should be used with a 20V MAX 4Ah lithium-ion battery or greater for optimal performance. The new EGO 56-Volt 8 Edger creates clean and precise edges around your driveway, sidewalks and patio with ease. Equip with a variable speed trigger, a lock off switch and a guide wheel with a depth adjustment knob. Compatible with all EGO ARC Lithium batteries for Power Beyond Belief. M18 FUEL 18V Li-Ion Brushless Cordless Hedge Trimmer Kit w/ 9.0Ah Battery & Rapid Charger The M18 FUEL Hedge Trimmer has the power to cut 3/4 in. branches, cuts up to 30% faster and provides up to 2 hours of run time per charge. Designed to meet landscape maintenance professional needs, the handle placement and weight distribution provide the best combination of balance and control. The trimmer features a slider-crank mechanism and all-metal gear case providing unmatched durability and longer life. The 24 in. blade trims more material in a single pass, increasing reach and productivity. The blade tip guard prevents damage to the property and the blades. The M18 FUEL Hedge Trimmer is fully compatible with 125 plus solutions on the M18 system. M18 FUEL 18V Li-Ion Brushless Cordless Hedge Trimmer Kit w/ 9.0Ah Battery & Rapid Charger is rated 4.9 out of 5 by 102. Rated 4 out of 5 by DC from Extremely Pleased with the power of the Milwaukee hedge trimmer.... Extremely Pleased with the power of the Milwaukee hedge trimmer. Rated 5 out of 5 by Ernest from Just try it out on some overgrown Wisteria. Walked... Just try it out on some overgrown Wisteria. Walked right through it. Far superior to the Craftmans 18V I had been using. Rated 5 out of 5 by Martin from Great tool. Works beautifully. Well-balanced and easy to handle.... Great tool. Works beautifully. Well-balanced and easy to handle.